Tom Snow is CEO of T. J. Snow Company, Inc., Chattanooga, TN, a manufacturer, remanufacturer and distributor of resistance-welding machinery, supplies and accessories: 423/894-6234; www.tjsnow.com. “They don’t build ’em like they used to” applies to resistance-welding (RW) machines in particular because these machines contain a lot of expensive copper and steel to meet accepted heavy-duty welding-machine standards. 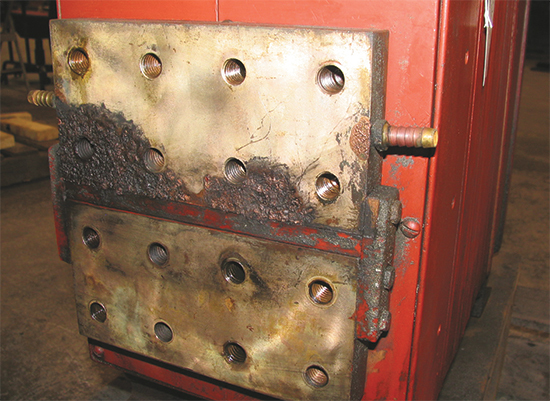 Before and after: Heavy-duty resistance-welding machines often are worth remanufacturing to new condition. The veteran Taylor-Winfield press-type combination projection- and spot-welding machine shown here was originally manufactured in the 1950s. It boasts a heavy-duty steel frame and cast-copper secondary conductors that prove expensive to produce new today. Due to the high secondary currents typically used in the RW process, often in the range of 30,000 A or more, many older U.S.-made brands were designed with massive water-cooled copper castings that are extremely expensive to produce today. In addition, machine frames of the past, compared to those made today, typically were fabricated with heavier steel sections—more rigid, to better handle high forging forces. In the United States, the age of light-duty press-type and rocker-arm resistance spot- and projection-welding machines began in the 1980s, when Japanese automobile manufacturers and their Japanese-owned Tier 1 suppliers brought their RW technology with them. Japanese machine designs had proven successful in their factories for many years. But, the diminutive machines stood out in stark contrast to the larger, heavier-duty American-made machines that conformed to the standards of the Resistance Welder Manufacturers Association (RWMA—now the Resistance Welding Manufacturing Alliance, a standing committee of the American Welding Society). To advertise an RW machine as meeting RWMA Standards, it must meet certain minimum specifications for weld pressure (forging force) and secondary amperage (welding heat), as published in RWMA Bulletin 16—Resistance Welding Equipment Standards. These variables in machine design are important because Class A resistance spot welds of maximum strength and optimum appearance cannot be produced without the proper input of weld current and force. For example, a standard 100-kVA RWMA Size 2 press-type spot welder with a relatively short 18-in. throat depth must have an air-cylinder diameter large enough to produce at least 4000 lb. of welding force at 80-psi incoming air pressure. Note: Weld-force requirements are less for longer throat depths. Similarly, an RWMA-standard 100-kVA transformer must be designed with copper windings and an electrolytic steel core large enough to produce a short circuit (tip-to-tip, without steel in the throat) secondary output of 31,000 A at 50-percent-duty cycle. And, an RW machine’s secondary amperage reading should be measured as RMS (root mean square), rather than the higher peak reading sometimes cited. Resistance-welding schedules are based on RMS, or effective current. The specified duty cycle of a transformer also is important, because kVA (kilovolt amps, a thermal rating), can be inflated by citing a lower duty cycle than this industry standard. For example, the same RW transformer rated to 100 kVA at 50-percent-duty cycle can be rated 224 kVA at 10-percent-duty cycle. After many years of use, an RW machine’s secondary connections can arc and lose conductivity. It is important to re-machine these secondary connections during the welder remanufacturing process. Also, installing a new programmable-type control is recommended as part of remanufacturing a heavy-duty resistance welder from the last century. This variable becomes particularly critical when weld-heat time (current-flow duration) of an RW application approaches or exceeds the available cool time of the process. Exceeding a machine’s rated duty cycle can lead to poor weld strength, overheating of the machine and eventual failure of the transformer. New welding machines designed to RWMA standards still are available today, but it takes a discriminating buyer to appreciate the reasons why these machines often are two to three times the price of an imported machine of the “same” kVA rating. This cost differential makes many older U.S.-made RW machines—even those dating back to the 1950s—prime candidates for remanufacturing. A heavy-duty used machine typically can be remanufactured for about half the price of a comparable new machine. Among the most desirable heavy-duty American-made RW machine brands from years past: Taylor-Winfield, Federal, Precision, Peer, Progressive, Banner and Sciaky. Since some of the respected manufacturers mentioned above also marketed light-duty models to compete with imports, it’s important to understand the differences. • Heavy-duty cast-copper secondary conductors with built-in water-cooling circuits. 1) Select a heavy-duty machine design worth remanufacturing. 2) Disassemble the machine completely, down to the last bolt. 3) Save electrical insulation materials and non-magnetic bolts for reuse. 4) Scrap the old control, unless it’s a current model with good vendor support. 5) Sandblast and spray-paint the frame. 7) Check the transformer for short-circuited coils and internal moisture, using a Megger (mega-ohm) meter. 8) Check for clogged water-cooling lines. 9) If necessary, send the transformer to a specialized repair facility. Most electric-motor shops lack the expertise to rewind RW-machine transformers. 10) Check for proper operation of the transformer’s multistep tap switch and repair or replace as required. 11) Remachine or replace worn parts, especially in the force-delivery system of press-type and rocker-arm machines. 12) Reassemble the machine using proper electrical insulation and nonconductive bolts. 13) When reassembling secondary copper connections, apply a thin coat of copper lube or similar electrically conductive oxide inhibitor. 14) Rebuild or replace the air cylinder. Cylinders often can be replaced at relatively low cost. When rebuilding an air cylinder, use all new packings and a new cylinder wall, if required. 15) Install a new filter, regulator, lubricator and gauge. 16) Install an entirely new water-cooling system, including hoses, manifolds, water-flow indicators and a water-flow switch. 17) For good water flow to all components, run water circuits in parallel, not series. 18) Test the machine to new-machine specifications. • Arms, electrode holders and all other secondary conductors fabricated of copper, rather than less-conductive brass. • Stacked-core RW transformers with adequate water-cooling circuits. • Easily accessible transformer tap switch with six to eight steps of coarse heat regulation. • In vertical-action press-type spot- and projection-welding machines, look for a roller-type or ball-bearing ram design; avoid the quill-type metal-to-metal rams commonly used in lower-cost machines. • Also relative to press-type welders, look for a machine with a fast-follow-up device built into the ram, such as a die spring or diaphragm-type air cylinder. • Other desirable features include adjustable- and retractable-stroke air cylinders. If you can’t decide between likely candidate machines for a remanufacture project, weigh the machines being considered and select the heaviest. And, for best results, use the suggested remanufacturing steps as outlined in the sidebar. Due to significant advances in RW process-control technology, plan to scrap old, obsolete controls and invest in a new control. And, if you’re willing to make a substantial investment to have the latest inverter-type mid-frequency direct current (MFDC) RW technology, new MFDC transformers and controls can be retrofitted to old machine frames. This single-phase AC to three-phase DC conversion can provide significant power savings, along with higher secondary currents and a more precisely controllable output. In addition, there is a retrofit control now available that converts an existing AC RW machine to inverter technology, including integral weld monitoring and adaptive feedback. And, this retrofit package preserves the robust transformer design of a standard AC resistance welder. The hi-tech inverter welders Ireland are portable in size, easy to carry and safer to use than the traditional welding machines, so they are becoming much popular these days. A clear factual article. Well built machines from previous decades can still be going strong if re-manufacturered. A welding positioner or cnc plasma cutter can be treated exactly the same as a resistance welder. Recycling metalworking machines from some great manufacturers.